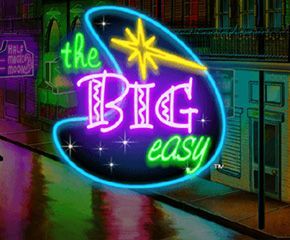 Big Easy is a slot game with a theme based on jazz music and the musicians who play at the nightclubs. This slot is loaded with five reels and 3 rows that allow you winning from twenty betting lines. These paylines can be adjusted as per your preference too. The reels are placed over the view of a street from olden days where clubs are decorated with neon lights outside. You can hear a wonderful jazz music to the game during the spins. The wagering limits here are set from £0.01 and the maximum you can raise this up to is £100 a turn. This amazing Jazz themed slot game was created by none other than the IGT Gaming, one of the most popular brands among hundreds of online casinos and millions of gamblers around the world. They are a genuine games development company with their presence in NYSE and NASDAQ. The symbols of Big Easy slots consists of a lady jazz singer with a purple hat, a man playing the trumpet, a saxophone, piano keys and the moon. The top payout symbol is the lady singer who pays fifty times on your total wagered amount on that spin. The low win symbols are represented by a lobster and mussels on a plate, a glass of whisky, a live music invite, a street lamp post and a colourfully lit street. The bonus one is the game logo that plays the role of two special features of the slot. Wild Bonus: As a wild feature of Big Easy slots, the game logo covers all the base symbols except for the moon which is shown as scatter but it does not give you any bonus as such. Moon symbol works like any other symbol with max pay of 20x on your bet with five of a kind. Bonus Level: This is triggered by the game logo with three or more of its appearance on the reels. With three of them, you could win 15, 10 or 8 free games with 4, 3 or 2 win multiplier. Four symbols can give you up to 20 free games and up to 10x win multiplier. Five symbols give up to 25 spins with the 10x multiplier. 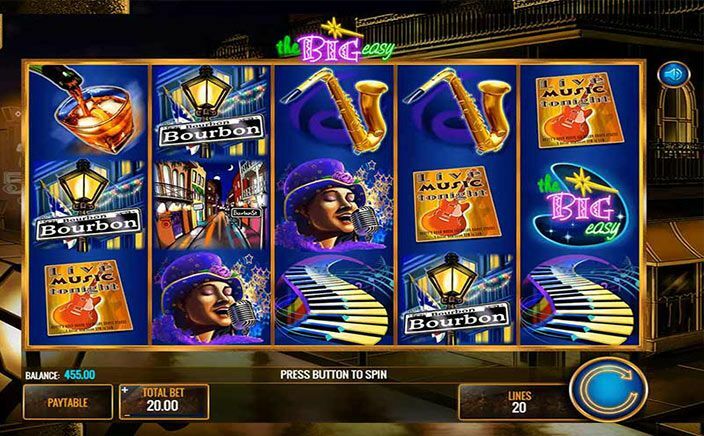 Big Easy slots is a jazz themed game with stunning visuals and sound effects. There are plenty of bonuses and surprises awaiting you too.